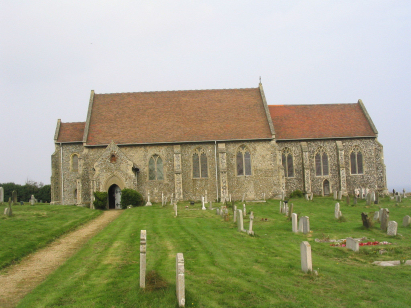 The parish of Mundesley sits on the northeastern coast of Norfolk about 4 miles northeast of the market town of North Walsham. Mundesley grew up as a minor port where a small gap in the low sandy cliffs allows a small stream to reach the North Sea. Cliffs to either side rise to around 30 metres above sea level so Mundesley with its wide beach was a natural site for low keeled ships to haul out on the sands. Mundesley was a noted fishing port where inshore boats searched for the local fish and shellfish. Nowadays Mundesley earns more from its sands as it is a popular bathing site especially with young families where the sands provide excellent seating and sunbathing (Norfolk weather permitting) without some of the more commercialised facilities of the larger resorts. Mundesley's High Street also provides much welcomed shopping and dining facilities for much of the area. All Saints church sits on the northern edge of Mundesley where the cliffs start to rise to the north. The building in a clifftop setting looks a little forlorn without tower or steeple but the building was in a ruinous state at the turn of the 20th century and what remains today is a mixture of restoration and rebuild. There is little of the original left but Pevsner identifies some Norman and some Perpendicular features which must come from the original building. 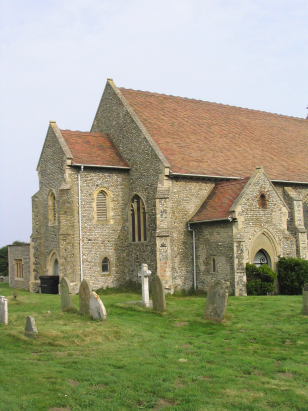 The church sits in a totally open site behind a typically Norfolk flint wall, an attractive lych gate gives access, the site has fine views over the resort and also out to sea. A single standard 800-entry register book covers the period of the transcript and runs on to be completed in 1892. This register is filmed on Microfilm MF1673 in the collection of the Norfolk Record Office which was used to prepare this transcript. This film is quite a modern one and benefits from the improved techniques now achievable. The image quality was excellent throughout, the same couldn't be said for some of the handwriting which was a little tricky at times. Due to the quality of the images, however, this was a relatively straightforward transcript and hopefully there haven't been too many misreads due to the handwriting.